One of my regular clients bought this native pony in the Yorkshire Dales and although the pony was in good enough condition when she got it home, it refused to eat anything at all. 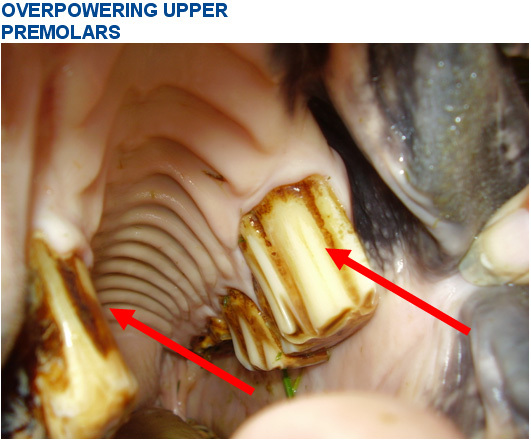 When I examined the pony, I found that the 306,307,308, 406,407,408 lower premolars was missing and that the 106, 107, 108, 206, 207, 208 upper premolars had become so tall that it was chewing into its lower gums resulting in severe ulceration of the gingiva on the mandible. The veterinarian took X-rays of the head and there was no sign of any teeth ever having been there. I decided to do two corrections 6 months apart to reduce the upper premolars carefully each time so as to avoid exposing the pulp chamber. After the first reduction the pony started eating immediately and now eats perfectly normal, managing grain as well as hay. 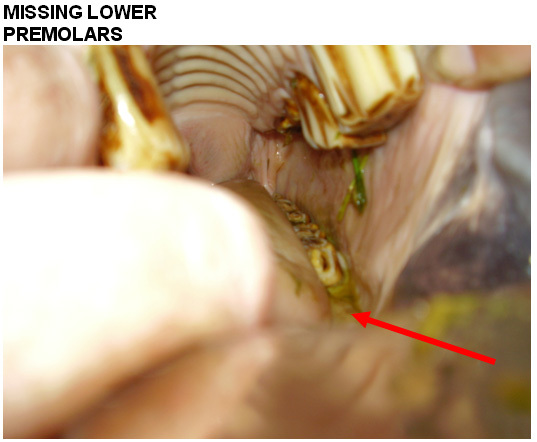 The missing premolars do not seem to hamper its digestion either as he seems to be holding his condition just fine. Only having 12 teeth in occlusion doesn't seem to stop him putting on weight at all.